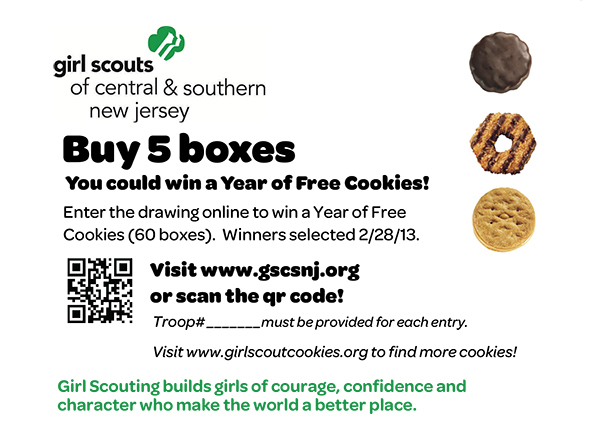 GSCSNJ Blog Space: Our Five Cookie Winners! We're finally announcing our winners! Mark from Indiana- Mark is a utility worker sent to NJ to help with the Sandy relief effort. We are so happy he came to help! “I plan to take the cookies to Riley Children's Hospital in Indianapolis and donate them for the children to enjoy. I really enjoy the cookies but I think the children will too. Thanks to everyone that entered and supported a GIRL! it's time to get ready for our fall Magazine and Nut Program!